The Twin Ports’ shipbuilding industry began in earnest in the winter of 1869-1870 when Lewis Merritt, his son Alfred, and Henry Ely built the Chaska, a seventy-two-foot-long, forty-nine-ton schooner — the largest ship built in Duluth at the time. Unfortunately, it was battered to pieces off the coast of Michigan’s Upper Peninsula a year later. 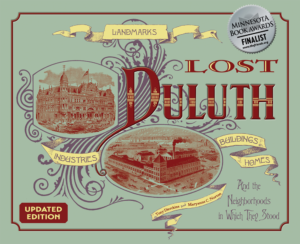 Perhaps Duluth’s most successful early shipbuilder was a French-Canadian named Napoleon Grignon, who arrived in Duluth in the 1870s and built the N. Grignon Shipyard on Minnesota Point at Buchanan Street. The firm later moved to the foot of Eleventh Avenue West. In 1880 Grignon incorporated his business as the Marine Iron and Shipbuilding Company; the company would go on to build many ships: fifty-seven of them between 1918 and 1940 alone. While ships would be built in earnest in Duluth and Superior over the next eighty years, the industry peaked during the world wars. In Superior, ten tugs launched at the Whitney Brothers Wharf and nineteen 260-foot ocean freighters were built at the Globe Shipyards during World War I. In Duluth, Alexander McDougall had revived his dormant American Steel Barge Company, renamed it McDougall-Duluth Ship Builders, Inc., and moved across the St. Louis River to Duluth. His dormant facilities in Superior had opened under new ownership as the Superior Shipbuilding Company in 1900; during the war, it produced twenty-five freighters for England, France, and America. McDougall’s new shipyard went up at the foot of Spring Street on the St. Louis River in 1917 to build ships for the Allied war effort. The town of Riverside developed near the plant for the workers at the facility. More than thirty buildings, including machine, boiler, paint, and sheet metal shops — as well as three piers — were active in ship production until the war ended. Afterward, McDougall retired and the company became Barnes-Duluth with financier Julius Barnes as president, but the shipyards produced nothing. 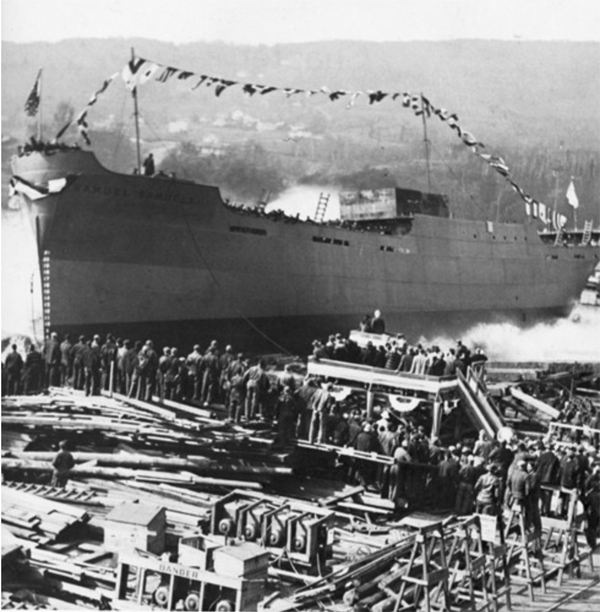 As World War II began Barnes-Duluth and several other dormant shipyards sprang back to life in the Twin Ports. The facilities employed over ten thousand men and women, averaging ten ships a month while producing a fleet of 230 vessels. In Duluth, Marine Iron and Shipbuilding supplied the Coast Guard with eighteen cutters, and thirteen plane-rearming boats and four subchasers came out of Inland Waterways. Zenith Dredge Company, formed in 1905 at the foot of Thirteenth Avenue West as a harbor construction company, converted to shipbuilding and produced eight tankers and thirteen cutters. Duluth’s Scott-Graff Lumber Company and Industrial Construction Company also got into the shipbuilding game, manufacturing one hundred landing barges. Across the bay in Superior, Globe delivered eight frigates and ten ocean-going tugs and Butler built thirteen coastal freighters, twelve frigates, and seven cargo carriers. On May 8, 1943, the Butler Yards became the first shipbuilder to ever launch five vessels in one day from the same shipyard. The launch was turned into a civic event when owner Robert Butler invited Canada’s Dionne Quints, the world’s first surviving quintuplets and arguably the most famous children in North America at the time, to christen the cargo ships. Over fifteen thousand people showed up to watch the small pack of nine-year-olds, also born in May, take the stage carrying champagne bottles. They entertained the crowd by singing songs in their native Quebecois in honor of their mother’s thirty-fourth birthday. Nearly all shipbuilding in the Twin Ports stopped as World War II came to an end. The Marine Iron and Shipbuilding yard closed in the 1950s. Barnes-Duluth sold to Butler in 1943 and was closed in 1945 and sold for a marina. The rest of the Riverside shipbuilding complex was destroyed in 1976.